From the Hancock County Courthouse, go two (2) blocks south on Court Street. The cemetery is on the southeast corner formed by Court Street and Hancock Street. It is next to the city oxidation pond. There are only a few depressions and a slab to indicate that the cemetery exists here. What remains of the cemetery is in terrible shape. A few large granite foundation blocks are scattered throughout the shrubs and young trees. An 1869 indenture (see below) speaks of stones set up to mark the boundaries of the one and one-fourth acre lot, and it is unknown whether these scattered blocks or the granite posts around the area are those boundary stones. The chapel faced west, and the entrance faced Court Street. The cemetery was on the southern side of the chapel. Located here per Diocese list. Click on Mary Friese to see list of Friese church members. 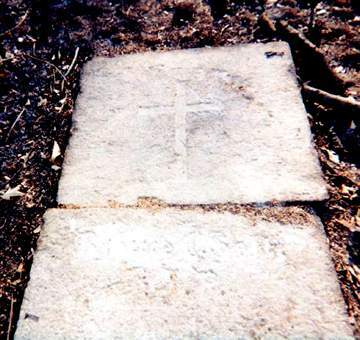 Grave pictured with Frank Friese's grave. Located here per Diocese list. Click on Mary Friese to see list of Friese church members. Unmarked Grave - Joseph Flury, Jr. Located here per Diocese list. A depression indicates the presence of the grave. Unmarked Grave - Joseph Flury, Sr. Located here per Diocese list. Located here per a separate sheet from the above, which says, "Colored, Congo Laughlin's child". In the church membership list, Congo Laughlin has wife named Theresa. Bottom of the sheet says "back fence" and the following names appear. Located here per Diocese sheet.